THE GOOD LIFE Daniel Kedan and Marianna Gardenhire at Backyard champion local farms for their menu. Daniel Kedan was fired suddenly from his first serious cooking job. In 2004, just a few years out of college, he'd landed a position as sous chef at Il Palio Restaurant in Shelton, Conn., running the kitchen virtually by himself. Then the restaurant was sold, and the new owner brought in a fancy chef from New York. "I thought if that's the way this business is," Kedan tells me on a recent morning, "I don't want anything to do with it." Soon, however, he went to Europe and had a gastronomic epiphany. While in Rome, he dined on a whole fish with salsa verde accompanied by a bowl of pasta and truffles. "That was the moment I knew what I was going to do with my life," says Kedan, who, along with his wife, pastry chef Marianna Gardenhire, opened Backyard in Forestville six months ago. After returning from Europe, Kedan quit his corporate deli job and moved to the Napa Valley to be part of the first Associate in Occupational Studies degree program at the Culinary Institute of America's St. Helena campus. It was there that he met Marianna, the only other person at the school who liked the Grateful Dead. Kedan talks about California like a classic East Coast transplant who followed the late-'90s jam band scene across the country, philosophy degree in one pocket, compass set to west in the other. "The first time I visited, I fell in love," gushes Kedan, who hasn't missed a summer on the Yuba River since 1999. "That's where I proposed," he says, "and that's where Marianna and I married ourselves." While still in school, Kedan honed his technical skills in the newly opened kitchen of Ad Hoc in Yountville. After stints at the General's Daughter in Sonoma, Solage in Calistoga and Cantinetta Piero in Yountville, Kedan and Gardenhire heeded the call of West County, with its earthier, less corporate, decidedly locavore vibe. 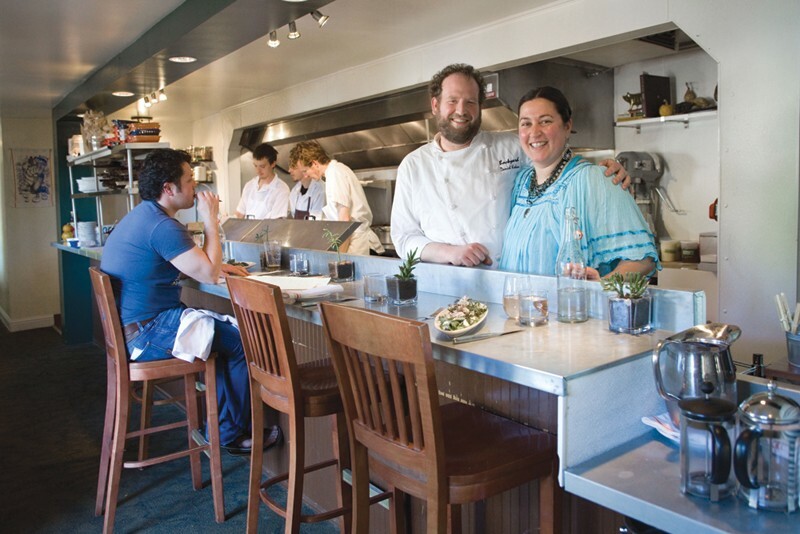 In 2010, the culinary couple started working in Sebastopol—Kedan at Peter Lowell's, Marianna at P30, whose fire burned bright and brief. Lowell's introduced Kedan to local farmers, as well as to Luke Hefele and two other cooks who now work with him at Backyard. Kedan euphemistically "parted ways" with Lowell a little more than a year later. "Working at Peter Lowell's was one of the best things that could've happened to me," says Kedan. He grins. "But leaving there was even better." Both he and Gardenhire realized that they were too stubborn to work for other people; it was time to become their own bosses. Given the easy camaraderie and efficiency of the long, open kitchen, it's hard to believe that Backyard (formerly Sarah's Forestville Kitchen) is still in its infancy. "It's been a rollercoaster," says Kedan, who gives equal shrift to both the ups and downs. "We borrowed every dollar to open this restaurant," he explains, including a serendipitous—and sizable—investment, at the last minute, from a man he's only met once. They opened on Nov. 1, just in time for the winter gloom to keep people hovered over their soup pots at home. But despite inconsistent business—recently, their best week was followed by their very worst—the owners have had a chance to work out the kinks, including parting with an early partner who didn't work out. If Kedan weren't so sincere, he'd be a cliché. He starts his day by doing qigong with Hefele, who in addition to cooking also teaches capoeira at Sebastopol's Shugyo Center. His restaurant is named for the abundance of locally grown ingredients that find their way onto his simple white plates. The homey décor consists of glass bowl terrariums, rustic plant boxes and local artwork. A bundle of sage sits by the cash register. And yet Kedan never once utters the phrase farm-to-table—he doesn't have to. During the hour that I'm here, watching him slice potatoes and scoop polenta, we are interrupted several times by farmers making deliveries. Kedan negotiates a price with Brad who's brought a bounty of beets, leeks, and frisse from his Roots of Creation Farm. An egg delivery comes in from RLR Vineyard, owned by Randolph Johnson, whose paintings decorate the walls of the dining room. The diverse menu—Backyard serves brunch, lunch and dinner—reads like a guidebook, with items like the duck egg frittata that includes Wyland Orchards duck eggs, Strong Arm Farm leeks and fava leaves, Redwood Hill chèvre, crispy First Light Farm potatoes and wild foraged watercress ($12). Wherever possible, the ingredients' source farms are listed on the menu. At one point, Kedan waves me over to the refrigerator. "You're not a vegetarian, are you?" he asks before showing me the half pig that he'll finish butchering later that day. As we talk, the very last of the locally grown potatoes are crisping in the fryer. Hefele is seasoning the kale chips that he's created as their substitute. "The cooks in this kitchen are truly amazing," says Kedan, who mentions the phrase "high standards" more than once. "I feel really lucky," he says. "We all learn from each other."